Nechodoma's work between 1912-1915 after his return from the Dominican Republic, was predominantly residential. However, he designed some institutional buildings one of which was The Masonic Temple for the Gran Logia Soberana established in 1892, designed in 1912 and finished in 1914. It is located on Ponce de Leon Avenue opposite a row of other institutional buildings which include The Casino de PR, The YMCA, The Ateneo Puertorriqueño, The Carnegie Library, The Casa de España and The Capitol Building, all built between 1910 and 1925. The Temple was used by the Masons until 1918 when the government acquired the building to house the offices of the recently created Food Commission. The Commission was created during WWI and upon the end of the war it was dissolved. 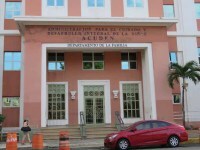 In 1919 the building was then occupied by the "Archivo Histórico de Puerto Rico" when the "Gran Logia Soberana" name on the front of the building was changed to "Archivo Hstórico de Puerto Rico". 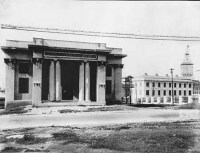 We do not know the date, but later on a high rise building for the Industrial Commission was constructed around the old Temple, it is now occupied by the Department of Social Services. The original structure has been totally absorbed within the larger structure with only the entrance mass originally behind the four columns seen on the old picture below still visible.